It feels like we have been here a long time and are anxious to get home with our baby! Today, Emily, went to the market for a couple hours with the other families while Bryson stayed back at the hotel and hung out with Evyn. Emily did some pretty sweet bargaining and came back with an awesome treasure. All in all today was pretty uneventful! Just bonding with our sweet girl and hanging out at the hotel. Sadly, adopting parents aren’t allowed to venture out with our babies because of some government “regulations” so we are pretty much stuck at the hotel. 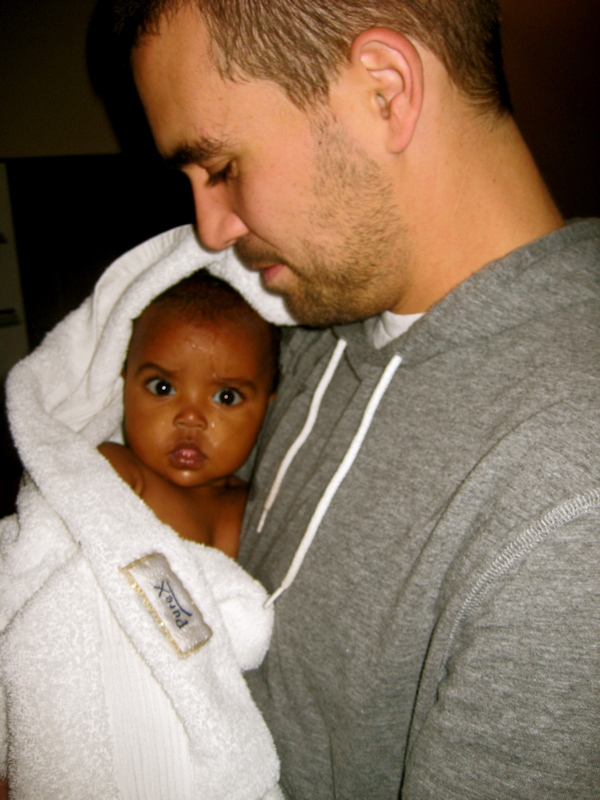 We keep from going stir crazy by hanging out with the other amazing families who are here adopting their little ones. It has really been awesome to get to each of the families and experience this adoption journey with them. **Back home the Passion team begins loading in Passion2010 Conference today! It feels strange being on the other side of the world while my team is working so hard back in ATL! I know they will do a great job! Praying for you guys!! 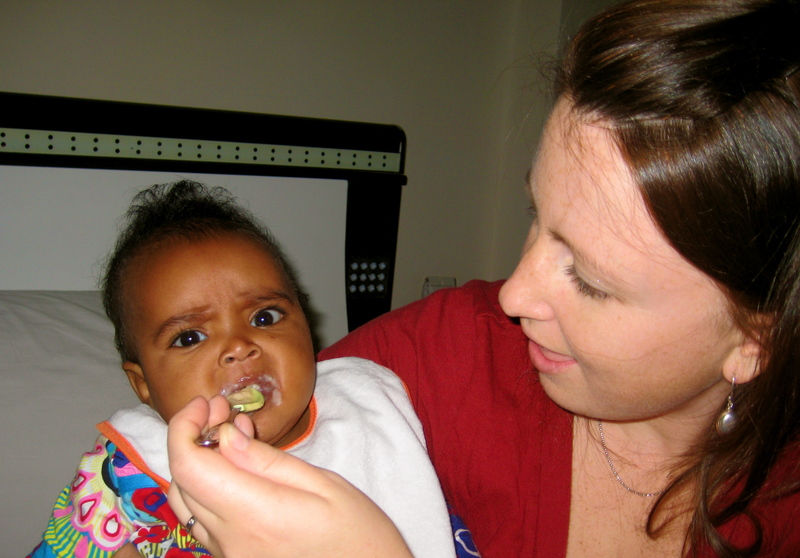 Trying baby food for the first time. Not a fan…yet. She is so beautiful! She looks like she just fits with you guys…Nash is going to love her! Love the pictures and updates I find myself checking all the time just to get more glimpses of the new Vogeltanz!! I think I am becoming a blog stalker:) Enjoy your down time it is going to be wild and crazy when you get home. We are praying for you all!! I love the sleepy pic. She’s precious. She get more and more beautiful everyday! 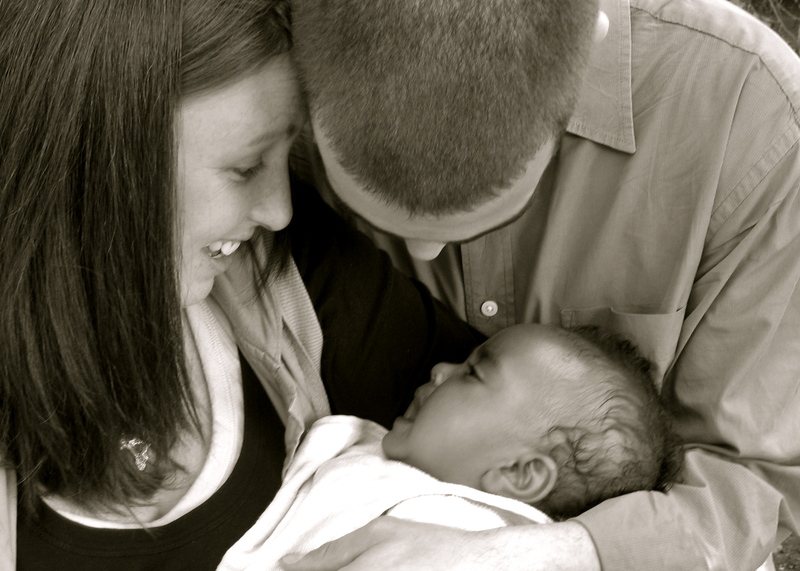 I love the gotcha day picture of you three. Pure sweetness! I can’t wait to see a picture of your beautiful family of 4! I’m going to plan a road trip to Athens!! Praying for and loving you guys! I’m glad you all getting some quantity & quality time together! We love seeing your photos & cannot wait to see Evyn in person. She is gorgeous! When do you come in to ATL? She is such a sweetie, we have really enjoyed watching this journey with you guys. Praying you. Seeing and hearing about your adventure is just another reminder of how great of a team the two of you are. I am so thankful for your guidance and wisdom. Can’t wait to see you all soon! She is beautiful and I’m super excited for your family! I will be praying for you over the next two weeks because I know things are so crazy. Very excited to meet her! What great pictures! So excited for you guys! You are in my prayers! I love all the pictures and updates! I keep checking just to see if there’s new stuff! You guys continue to be in my prayers and we can’t wait to see you soon! She is stunning! I can not WAIT to see her 🙂 praying for you all it’s awesome you can just be together right now! She is so BEAUTIFUL! Kristian and I are praying for you guys and can’t wait to meet Evyn soon. Love yall! I LOVE BABY EVYN!!!! and her parents and big brother too! Keep posting lots of pics! i think we all are total blog stalkers now! We were in small town Georiga over the holidays with no internet access. Last night when we got home I turned on the computer as fast as I could just so I could see pictures of baby Evyn and see how y’all were doing. Aaron and I are thrilled that you have made it to this point in your adoption journey and are continuing to pray for you as you make your way home soon. dummy me has been waiting for these on facebook and then last night i saw someone reference your blog on facebook and i was like OHHHH YESS of course. i just can’t tell you how much joy these pics give me. em, the one of you looking at her tearfully i have one like that of me with mabes the day i held her the 1st time– you will always treasure it. she is just as gorgeous as we thought she was– even moreso. and she will LOVE her brother. loved the post from mimi that he was bouncing around the house w. joy..what a beautiful picture. we love you and are praying and thrilled to share this bond with you!!! Wow, those eyes! Excited for you…can’t wait to meet her. This makes me so happy!! How exciting to be able to witness this with you guys! Unbelievable!! Love you guys! Beautiful. So proud of you both and so honored to be a small part of your journey. She is beautiful!!! We are super excited for you and for the journey ahead of you. Have a safe trip home. Em……Bryson! She is amazing, beautiful, full of life, and such a glow in her eyes! I’m excited that God is telling and weaving a story of MANY for his children. I love that this process has been a JOURNEY with others who will be new friends and with your old friends back home! 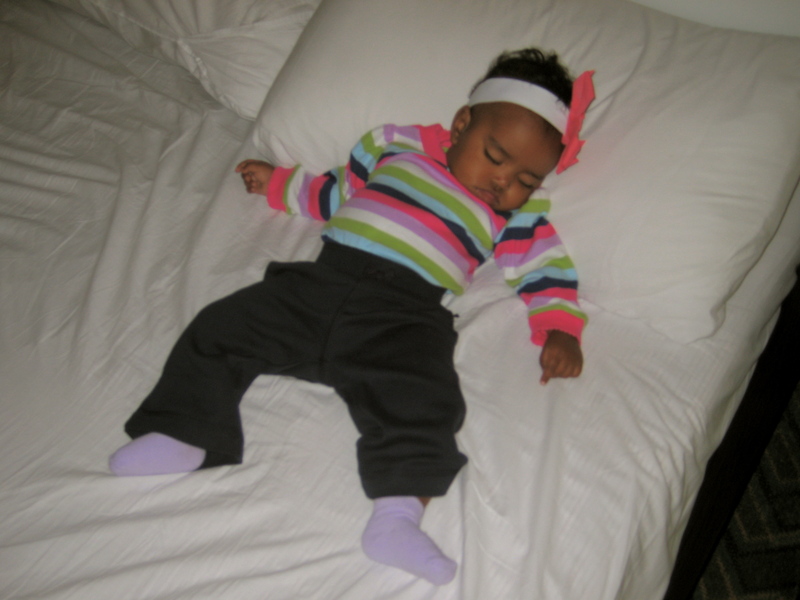 We’re eager and excited to receive your precious bundle of Joy…Evyn….so angelic! Be careful, excited for Nash to meet his sister, and hope to see you this weekend at P10. Praying for peace, simplicity, incredible joy……Savor the journey and get home safely! What beautiful photos! And such a beautiful family! Congrats to you all. You will continue to be in my prayers! YAY! Lovin’ your updates girl!!! Loving your pictures and updates on baby girl! She is precious! Praying!! Love the bath time pic! So sweet! Cam and I really think she is one of the most beautiful babies! We are so happy for you guys!!! She is BEAUTIFUL! You can just see how joyful Bryson and you are with her in your arms. I am praying for you all and I cannot wait for you to get back home and show off your new baby girl. I love seeing God’s miracles at work your lives! I’m so thrilled for you guys. She is stunning and so joyful. Praying for safe travels back!! !